Establishment of the Georgian SSR. Democratic Republic of Georgia government exiled to Leuville-sur-Orge, France and the United Kingdom. The Russian Soviet Federative Socialist Republic, previously known as the Russian Soviet Republic and the Russian Socialist Federative Soviet Republic, as well as being unofficially known as the Russian Federation, Soviet Russia, or simply Russia, was an independent state from 1917 to 1922, and afterwards the largest, most populous and most economically developed of the 15 Soviet socialist republics of the Soviet Union (USSR) from 1922 to 1991, then a sovereign part of the Soviet Union with priority of Russian laws over Union-level legislation in 1990 and 1991, during the last two years of the existence of the USSR. The Russian Republic comprised sixteen smaller constituent units of autonomous republics, five autonomous oblasts, ten autonomous okrugs, six krais and forty oblasts. Russians formed the largest ethnic group. 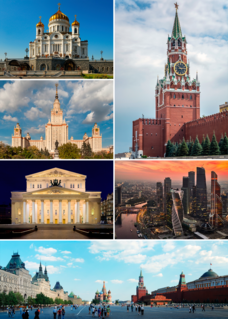 The capital of the Russian SFSR was Moscow and the other major urban centers included Leningrad, Novosibirsk, Yekaterinburg, Nizhny Novgorod and Samara. The Social Democratic Party of Georgia, also known as the Georgian Menshevik Party, was a Georgian Marxist, and later, social democratic political party. It was founded in the 1890s by Nikolay Chkheidze, Silibistro Jibladze, Egnate Ninoshvili, Noe Zhordania and others. It became the Georgian branch of the Russian Social Democratic Labour Party. After 1905, Georgian social democrats joined the Menshevik faction, except for some such as Joseph Stalin, Grigol Ordzhonikidze and Makharadze. Several leaders were elected to the Russian Duma from Kutais or Tifli: Nikolay Chkheidze, Akaki Chkhenkeli, Evgeni Gegechkori, Isidore Ramishvili, Irakly Tsereteli, Noe Zhordania. The independence of Georgia had been recognized by Russia in the Treaty of Moscow, signed on 7 May 1920, and the subsequent invasion of the country was not universally agreed upon in Moscow. It was largely engineered by two influential Georgian-born Soviet/Russian officials, Joseph Stalin and Sergo Ordzhonikidze, who on 14 February 1921 got the consent of Russian leader Vladimir Lenin to advance into Georgia, on the pretext of supporting "peasants and workers rebellion" in the country. 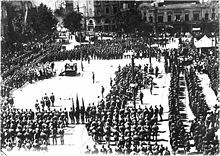 Russian forces took the Georgian capital Tbilisi (then known as Tiflis to most non-Georgian speakers) after heavy fighting and declared the Georgian Soviet Socialist Republic on 25 February 1921. The rest of the country was overrun within three weeks, but it was not until September 1924 that Soviet rule was firmly established. Almost simultaneous occupation of a large portion of southwest Georgia by Turkey (February–March 1921) threatened to develop into a crisis between Moscow and Ankara, and led to significant territorial concessions by the Soviets to the Turkish National Government in the Treaty of Kars. The Treaty of Moscow, signed between Soviet Russia (RSFSR) and the Democratic Republic of Georgia (DRG) in Moscow on May 7, 1920, granted Georgia de jure recognition of independence in exchange of the promise not to grant asylum on Georgian soil to troops of powers hostile to Bolshevik Russia. Joseph Vissarionovich Stalin was a Georgian revolutionary and Soviet politician. He led the Soviet Union from the mid–1920s until 1953 as General Secretary of the Communist Party of the Soviet Union (1922–1952) and Premier (1941–1953). While initially presiding over a collective leadership as first among equals, he ultimately consolidated enough power to become the country's de facto dictator by the 1930s. A communist ideologically committed to the Leninist interpretation of Marxism, Stalin helped to formalise these ideas as Marxism–Leninism, while his own policies became known as Stalinism. The February Revolution, known in Soviet historiography as the February Bourgeois Democratic Revolution, was the first of two revolutions which took place in Russia in 1917. The Transcaucasian Democratic Federative Republic, also known as the Transcaucasian Federation, was a short-lived South Caucasian state extending across what are now the modern-day countries of Armenia, Azerbaijan, and Georgia, plus parts of Eastern Turkey as well as Russian border areas. The Democratic Republic of Georgia existed from May 1918 to February 1921 and was the first modern establishment of a Republic of Georgia. Despite relatively wide public support and some successful reforms, the Social Democratic leadership of Georgia failed to create a stable economy or build a strong, disciplined army capable of opposing an invasion. Although there were a significant number of highly qualified officers who had served in the Imperial Russian military, the army as a whole was underfed and poorly equipped. A parallel military structure recruited from members of the Menshevik Party, the People's Guard of Georgia, was better motivated and disciplined, but being a lightly-armed, highly politicized organization dominated by party functionaries, had little usefulness as a combat force. The People's Guard of Georgia was a Social-Democrat-dominated volunteer force of Georgian former soldiers and civilians, active during the Russian Revolution of 1917 and the Democratic Republic of Georgia from 5 September 1917 to 18 March 1921. It consisted of 2,000 full-time members and 18 field battalions drafted on a territorial basis. In war time it could mobilize up to 10,000 to 12,000 citizens. The commander of the People's Guard was Valiko Jugheli, and notable members included Kakutsa Cholokashvili, Alexander Koniashvili, Alexander Maisuradze, and Vladimer Goguadze. Red Army Caucasus Front Headquarters, c. 1921. From left to right: Sergei Ivanovich Gusev, Grigol Ordzhonikidze, Mikhail Tukhachevsky, Valentin Trifonov, uncertain. All four named officers would be killed during Stalin's Great Purge. Since early 1920, local Bolsheviks were actively fomenting political unrest in Georgia, capitalizing on agrarian disturbances in rural areas and also on inter-ethnic tensions within the country. The operational centre of the Soviet military-political forces in the Caucasus was the Kavburo (or Caucasian Office) attached to the Central Committee of the Russian Communist Party. Set up in February 1920, this body was chaired by the Georgian Bolshevik Grigol Ordzhonikidze, with Sergey Kirov as his vice-chairman. The Sovietization of the Caucasus appeared to Bolshevik leaders to be a task which would be easier to achieve while the Allied powers were preoccupied with the Turkish War of Independence;  furthermore, the Ankara-based Turkish national government of Mustafa Kemal Atatürk had expressed its full commitment to close co-operation with Moscow, promising to compel "Georgia … and Azerbaijan … to enter into union with Soviet Russia … and … to undertake military operations against the expansionist Armenia." The Soviet leadership successfully exploited this situation and sent in its army to occupy Baku, the capital of the Azerbaijan Democratic Republic. The Caucasus or Caucasia is an area situated between the Black Sea and the Caspian Sea and occupied by Russia, Georgia, Azerbaijan, and Armenia. It is home to the Caucasus Mountains, including the Greater Caucasus mountain range, which has historically been considered a natural barrier between Eastern Europe and Western Asia, but is today accepted by the majority of scholars as being part of Asia. Sergei Mironovich Kirov was a close, personal friend to Joseph Stalin, and a prominent early Bolshevik leader in the Soviet Union. Kirov rose through the Communist Party ranks to become head of the party organization in Leningrad. The Georgian coup in May 1920 was an unsuccessful attempt to take power by the Bolsheviks in the Democratic Republic of Georgia. Relying on the 11th Red Army of Soviet Russia operating in neighboring Azerbaijan, the Bolsheviks attempted to take control of a military school and government offices in the Georgian capital of Tiflis on May 3. 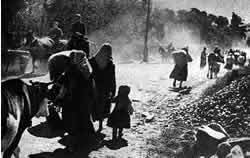 The Georgian government suppressed the disorders in Tiflis and concentrated its forces to successfully block the advance of the Russian troops on the Azerbaijani-Georgian border. The Georgian resistance, combined with an uneasy war with Poland, persuaded the Red leadership to defer their plans for Georgia’s Sovietization and recognize Georgia as an independent nation in the May 7 treaty of Moscow. 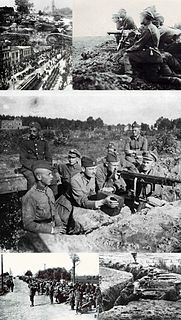 The Polish–Soviet War was fought by the Second Polish Republic, Ukrainian People's Republic and the proto-Soviet Union over a region comparable to today's westernmost Ukraine and parts of modern Belarus. The Second Polish Republic, commonly known as interwar Poland, refers to the country of Poland in the period between the First and Second World Wars (1918–1939). Officially known as the Republic of Poland, sometimes Commonwealth of Poland, the Polish state was re-established in 1918, in the aftermath of World War I. When, after several regional conflicts, the borders of the state were fixed in 1922, Poland's neighbours were Czechoslovakia, Germany, the Free City of Danzig, Lithuania, Latvia, Romania and the Soviet Union. It had access to the Baltic Sea via a short strip of coastline either side of the city of Gdynia. Between March and August 1939, Poland also shared a border with the then-Hungarian governorate of Subcarpathia. The Second Republic ceased to exist in 1939, when Poland was invaded by Nazi Germany, the Soviet Union and the Slovak Republic, marking the beginning of the European theatre of World War II. The cessation of Red Army operations against Poland, the defeat of the White Russian leader Wrangel, and the fall of the First Republic of Armenia provided a favorable situation to suppress the last independent nation in the Caucasus to resist Soviet control. By that time, the British expeditionary corps had completely evacuated the Caucasus, and the West was reluctant to intervene in support of Georgia. The tactics used by the Soviets to gain control of Georgia were similar to those applied in Azerbaijan and Armenia in 1920, i.e., to send in the Red Army while encouraging local Bolsheviks to stage unrest; however, this policy was difficult to implement in Georgia,  where the Bolsheviks did not enjoy popular support and remained an isolated political force. Shortly after the Bolshevik revolt, the Armenian-based Red Army units quickly came to the aid of the insurrection, though without Moscow's formal approval. When the Georgian government protested to the Soviet envoy in Tbilisi, Aron Sheinman, over the incidents, he denied any involvement and declared that the disturbances must be a spontaneous revolt by the Armenian communists. Meanwhile, the Bolsheviks had already set up a Georgian Revolutionary Committee (Georgian Revkom ) in Shulaveri, a body that would soon acquire the functions of a rival government. Chaired by the Georgian Bolshevik Filipp Makharadze, the Revkom formally applied to Moscow for help. By 17 February, Soviet infantry and cavalry divisions supported by aircraft were less than 15 kilometers northeast of Tbilisi. The Georgian army put up a stubborn fight in defense of the approaches to the capital, which they held for a week in the face of overwhelming Red Army superiority. From 18 to 20 February, the strategic heights of Kojori and Tabakhmela passed from hand to hand in heavy fighting. Georgian forces under General Giorgi Mazniashvili managed to push the Soviets back inflicting heavy losses; they quickly regrouped and tightened the circle around Tbilisi. By 23 February, the railway bridges had been restored, and Soviet tanks and armoured trains joined in a renewed assault on the capital. While the armoured trains laid down suppressing fire, tanks and infantry penetrated the Georgian positions on the Kojori heights. On 24 February, the Georgian commander-in-chief, Giorgi Kvinitadze, bowed to the inevitable and ordered a withdrawal to save his army from complete encirclement and the city from destruction. The Georgian government and the Constituent Assembly evacuated to Kutaisi in western Georgia, which dealt the Georgian army a significant morale blow. On 25 February, the triumphant Red Army entered Tbilisi. Bolshevik soldiers engaged in widespread looting. The Revkom headed by Mamia Orakhelashvili and Shalva Eliava ventured into the capital and proclaimed the overthrow of the Menshevik government, the dissolution of the Georgian National Army and People’s Guard, and the formation of a Georgian Soviet Socialist Republic. On the same day, in Moscow, Lenin received the congratulations of his commissars – "The red banner blows over Tbilisi. Long live Soviet Georgia!" The British Mark V tanks acquired by the Red Army in the course of the Civil War and Foreign Intervention contributed to the Soviet victory in the battle for Tbilisi. Georgian commanders planned to concentrate their forces at the town of Mtskheta, northwest of Tbilisi, and continue fighting on new lines of defense; the fall of the capital, however, had heavily demoralized the Georgian troops, and Mtskheta was abandoned. The army was gradually disintegrating as it continued its retreat westward, offering sometimes fierce but largely unorganized resistance to the advancing Red Army troops. Sporadic fighting continued for several months as the Soviets secured the major cities and towns of eastern Georgia. The Mensheviks entertained hopes of aid from a French naval squadron cruising in the Black Sea off the Georgian coast. On 28 February, the French opened fire on the 31st Rifle Division of the 9th Red Army under V. Chernishev, but did not land troops. The Georgians managed to regain control of the coastal town of Gagra, but their success was temporary. Soviet forces joined by Abkhaz peasant militias, the Kyaraz, succeeded in taking Gagra on 1 March, New Athos on 3 March, and Sukhumi on 4 March; they then advanced eastward to occupy Zugdidi on 9 March and Poti on 14 March. The Georgians’ attempt to hold out near Kutaisi was spoiled by the surprise advance of a Red Army detachment from North Caucasia, which traversed the virtually impenetrable Mamisoni Pass through deep snow drifts, and advanced down the Rioni Valley. After a bloody clash at Surami on 5 March 1921, the 11th Red Army also crossed the Likhi Range into the western part of the country. On 10 March Soviet forces entered Kutaisi, which had been abandoned, the Georgian leadership, army and People’s Guard having evacuated to the key Black Sea port city of Batumi in southwest Georgia. Some Georgian forces withdrew into the mountains and continued to fight. When the Turkish authorities proclaimed the annexation of Batumi on 16 March the Georgian government was forced to make a choice. Their hopes for French or British intervention had already vanished. France had never considered sending an expeditionary force, and the United Kingdom had ordered the Royal Navy not to intervene; furthermore, on 16 March the British and Soviet governments signed a trade agreement, in which Prime Minister Lloyd George effectively promised to refrain from anti-Soviet activities in all territories of the former Russian Empire. Simultaneously, a treaty of friendship was signed in Moscow between Soviet Russia and the Grand National Assembly of Turkey, whereby Ardahan and Artvin were awarded to Turkey, which renounced its claims to Batumi. The Turks, despite the terms of the treaty, were reluctant to evacuate Batumi and continued its occupation. Fearing permanent loss of the city to Turkey, Georgian leaders agreed to talks with the Revkom. In Kutaisi, Georgian Defense Minister Grigol Lordkipanidze and the Soviet plenipotentiary Avel Enukidze arranged an armistice on 17 March, and then, on 18 March, an agreement which allowed the Red Army to advance in force to Batumi. Amid the ongoing Turkish-Soviet consultations in Moscow, the armistice with the Mensheviks allowed the Bolsheviks to act indirectly from behind the scenes, through several thousand soldiers of the Georgian National Army mobilized at the outskirts of Batumi and inclined to fight for the city. On 18 March, the remaining Georgian army under General Mazniashvili attacked Batumi and was engaged in heavy street fighting with the Turkish army. While the battle raged, the Menshevik government boarded an Italian vessel and sailed into exile escorted by French warships. The battle ended on 19 March with the port and most of the city in Georgian hands. On the same day, Mazniashvili surrendered the city to the Revkom and Zhloba’s cavalry entered Batumi to reinforce Bolshevik authority there. In Georgia, an intellectual resistance to the Bolshevik regime and occasional outbreaks of guerrilla warfare evolved into a major rebellion in August 1924. Its failure and the ensuing wave of large-scale repressions orchestrated by the emerging Soviet security officer, Lavrentiy Beria, heavily demoralized the Georgian society and exterminated its most active pro-independence part. Within a week, from 29 August to 5 September 1924, 12,578 people, chiefly nobles and intellectuals, were executed  and over 20,000 exiled to Siberia. From that time, no major overt attempt was made to challenge Soviet authority in the country until a new generation of anti-Soviet movements emerged in the late 1970s. ↑ "iveria" . Retrieved 1 November 2014. ↑ "Советско-грузинская война 1921 г. (Soviet-Georgian war of 1921)". Хронос ("Hronos") (in Russian). Retrieved 2006-11-02. ↑ Suny. The Making of the Georgian Nation. pp. 185–190. ↑ Suny. The Making of the Georgian Nation. pp. 191–192. ↑ Carr, E.H. (1950). The Bolshevik Revolution 1917–1923. Vol. I. London: MacMillan & Co. pp. 342–343. ↑ Gachechiladze, Revaz (2012). "Geopolitics and foreign powers in the modern history of Georgia: Comparing 1918 – 21 and 1991 – 2010". In Jones, Stephen F. The Making of Modern Georgia, 1918 – 2012: The first Georgian Republic and its successors. New York City: Routledge. pp. 22–23. ↑ Suny. The Making of the Georgian Nation. pp. 207–209. ↑ Ėkshtut, Simon (September 2014). "ЮРИЙ ТРИФОНОВ:ВЕЛИКАЯ СИЛА НЕДОСКАЗАННОГО" (PDF). Rodina. Archived from the original (PDF) on 2016-01-18. 1 2 3 Beichman, A. (1991). The Long Pretense: Soviet Treaty Diplomacy from Lenin to Gorbachev, p. 165. Transaction Publishers. ISBN 0-88738-360-2. ↑ "Glossary of Events: Georgian Affair-1921". Encyclopedia of Marxism . Retrieved 2006-11-02. ↑ Hovannisian, Richard G. (1996). The Republic of Armenia, Vol. IV: Between Crescent and Sickle. University of California Press. pp. 287–289, 405. ISBN 0520088042. ↑ Арутюнов, Аким Александрович (Arutyunov, Akim Aleksandrovich) (1999), Досье Ленина без ретуши. Документы. Факты. Свидетельства. (Lenin’ Dossier without Retouching. Documents, Facts, and Evidences). Moscow: Вече (Veche). ISBN 5-7838-0530-0 (in Russian). See also an abridged online version of the book. 1 2 3 4 5 Lang, DM (1962). A Modern History of Georgia, pp. 234–236. London: Weidenfeld and Nicolson. "Счастье на штыках (Happiness upon Bayonets)". Исторический альманах “Лабиринт времен” (Historic almanac The Labyrinth of Times) (in Russian). Retrieved 2006-10-29. Арутюнов, Аким Александрович (Arutyunov, Akim Aleksandrovich) (1999), Досье Ленина без ретуши. Документы. Факты. Свидетельства. (Lenin’ Dossier without Retouching. Documents, Facts, and Evidences). Moscow: Вече (Veche). ISBN 5-7838-0530-0 (in Russian). See also an abridged online version of the book Archived 2008-11-17 at Wikiwix. ↑ This pamphlet by Trotsky is perhaps the best known book justifying the invasion. It was a rebuttal to Karl Kautsky's work which declared Georgia to be a democratic socialist workers and peasants republic. Trotsky, Leon (1922), Between Red and White: a study of some fundamental questions of revolution, with particular reference to Georgia (Social democracy and the wars of intervention) Archived 2005-02-04 at the Wayback Machine . Encyclopedia of Marxism . Retrieved on 17 April 2007. Kautsky, Karl (translated by H. J. Stenning; 1921), Georgia: A Social-Democratic Peasant Republic – Impressions And Observations. Encyclopedia of Marxism . Retrieved on 17 April 2007. ↑ "Тифлисская операция 1921 (Tiflis Operation of 1921)". Большая советская энциклопедия (БСЭ) (Great Soviet Encyclopedia) (in Russian) (3 ed.). 1969–1978. Archived from the original on 2007-09-29. ↑ "V.I. Lenin. The Question of Nationalities or "Autonomisation"". Encyclopedia of Marxism . Retrieved 2006-11-02. ↑ King, Charles (2008), The Ghost of Freedom: A History of the Caucasus, p. 173. Oxford University Press, ISBN 0-19-517775-4. ↑ largely based upon extensive studies conducted in the "Georgian Archive" of Houghton Library, Harvard University, which has been opened for researchers since September 1988. ↑ Saakashvili Urges for EU's Help. Civil Georgia . 2008-05-12. ↑ Saakashvili Address on Russia’s Abkhazia, S. Ossetia Recognition. Civil Georgia. 2008-08-26. ↑ Georgia’s Statehood Under Danger, Resist Enemy Everywhere – Government Tells the Nation. Civil Georgia. 2008-08-10. ↑ Lee, Eric (Autumn 2008), Global Labor Notes / Russia invades – and the labour movement is silent Archived 2009-07-25 at the Portuguese Web Archive. Democratiya . ↑ "Georgia: 25 February Declared 'Soviet Occupation Day'". Stratfor. Archived from the original on 7 March 2012. Retrieved 1 November 2014. ↑ Civil Georgia. "25 February Declared Day of Soviet Occupation". Archived from the original on 3 August 2012. Retrieved 1 November 2014. Allen, WED (May 1927). "New Political Boundaries in the Caucasus". Geographical Journal. 69, No. 5 (5): 430–441. JSTOR 1782090. Blank, Stephen (1993). The Soviet Conquest of Georgia. Central Asian Survey, 33–46:12. Anita L. Burdett, ed. (1 June 2001). "Caucasian Boundaries. Documents and Maps. 1802–1946". Central Asian Survey. 20 (2): 229–249. doi:10.1080/02634930120073523. Archived from the original on 3 January 2013. (in Russian) Борисова, И.Д. Российско-грузинские межреспубликанские связи 1917–1922 гг. / И.Д. Борисова // PANDECTAE: сб. ст. преподавателей, аспирантов и соискателей каф. гос.-правовых дисциплин юрид. фак. ВГПУ. – Владимир: Изд-во ВГПУ, 2004. * Stephen F. Jones (October 1988). "The Establishment of Soviet Power in Transcaucasia: The Case of Georgia 1921-1928". Soviet Studies . 40, No. 4 (4): 616–639. JSTOR 151812. Kautsky, Karl: Georgia: A Social-Democratic Peasant Republic - Impressions And Observations . International Bookshops Ltd., London [etc.] 1921. Suny, Ronald Grigor (1994). The Making of the Georgian Nation. Bloomington, Indiana: Indiana University Press. Communist Takeover and Occupation of Georgia. "Special Report No. 6 of the Select Committee on Communist Aggression", United States House of Representatives, 83rd Congress, 2nd session. 31 December 1954. Washington, D.C.: U.S. Government Printing Office. 1955. (in Russian) "Оккупация и фактическая аннексия Грузии". Документы и материалы. Сост. А. Ментешашвили, ред. А. Сургуладзе, Тбилиси, 1990. Georgia, formally the Georgian Soviet Socialist Republic, was one of the republics of the Soviet Union from its inception in 1922 to its breakup in 1991. Coterminous with the present-day republic of Georgia, it was based on the traditional territory of Georgia, which had existed as a series of independent states in the Caucasus prior to annexation by the Russian Empire in 1801. Independent again as the Democratic Republic of Georgia in 1918, it was annexed by Soviet forces, who invaded it in 1921. The Georgian SSR was subsequently formed, though from 1922 until 1936 it was a part of the Transcaucasian Socialist Federative Soviet Republic, which existed as a union republic within the USSR. From November 18, 1989, the Georgian SSR declared its sovereignty over Soviet laws. The republic was renamed the Republic of Georgia on November 14, 1990, and subsequently became independent before the dissolution of the Soviet Union on April 9, 1991, whereupon each former SSR became a sovereign state. Grigory Konstantinovich Ordzhonikidze, generally known as Sergo Ordzhonikidze ; 24 October [O.S. 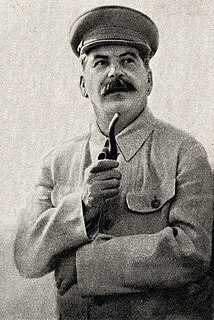 12 October] 1886, Kutais Governorate – 18 February 1937, Moscow) was a Georgian Bolshevik, later member of the CPSU Politburo, the head of the Supreme Soviet of the National Economy and close associate of Joseph Stalin. Ordzhonikidze, Stalin and Anastas Mikoyan comprised what was jokingly referred to as the "Caucasian Clique." The August Uprising was an unsuccessful insurrection against Soviet rule in the Georgian Soviet Socialist Republic from late August to early September 1924. The Turkish–Armenian war, known in Turkey as the Eastern Operation or Eastern Front of the Turkish War of Independence, refers to a conflict in the autumn of 1920 between the First Republic of Armenia and the Turkish nationalists, following the signing of the Treaty of Sèvres. After an initial Armenian occupation of what is now eastern Turkey, the army of the Turkish National Movement under Kâzım Karabekir reversed the Armenian gains and further invaded and defeated Armenia, also recapturing territory which the Ottoman Empire had lost to the Russian Empire in 1855 and 1878. Mamia Orakhelashvili was a Georgian Bolshevik and Soviet politician energetically involved in the revolutionary movement in Russia and Georgia. The Svanetian uprising of 1921 was an unsuccessful rebellion against the recently established Bolshevik regime in Georgia. Polikarp "Budu" Mdivani was a veteran Georgian Bolshevik and Soviet government official energetically involved in the Russian Revolutions and the Civil War. In the 1920s, he played an important role in Sovietization of the Caucasus, but later led Georgian Communist opposition to Joseph Stalin's centralizing policy during the Georgian Affair of 1922. In the 1930s, he was persecuted for his support to the Trotskyite opposition and executed during the Great Purge. The Georgian affair of 1922 was a political conflict within the Soviet leadership about the way in which social and political transformation was to be achieved in the Georgian SSR. The dispute over Georgia, which arose shortly after the forcible Sovietization of the country and peaked in the latter part of 1922, involved local Georgian Bolshevik leaders, led by Filipp Makharadze and Budu Mdivani, on one hand, and their de facto superiors from the Russian SFSR, particularly Joseph Stalin and Grigol Ordzhonikidze, on the other hand. The content of this dispute was complex, involving the Georgians' desire to preserve autonomy from Moscow and the differing interpretations of Bolshevik nationality policies, and especially those specific to Georgia. One of the main points at issue was Moscow's decision to amalgamate Georgia, Armenia and Azerbaijan into Transcaucasian SFSR, a move that was staunchly opposed by the Georgian leaders who urged for their republic a full-member status within the Soviet Union. Georgiy Aleksandrovich Atarbekov, born Atarbekyan was an Armenian Bolshevik and Soviet security police official.